TouchPoint has an app for your iPhone or Android. 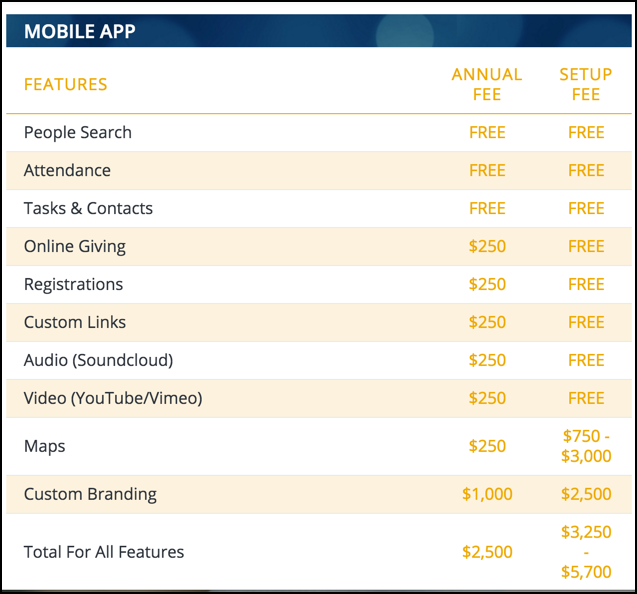 The app itself is free for all TouchPoint clients, with several ministry-related options included. However, for a fee, your church can choose to add other options on an a la carte basis. We priced it this way, so you can pick and choose just what you need. While these a la carte items have a yearly fee, we only charge a setup fee for Maps and Custom Branding. The fee for Custom Links is not per link, but for any links you want on your app. Go to the App Store or Google Play Store and download the app for free. Contact TouchPoint (info@TouchPointSoftware.com) to find out how to upgrade and add other options. TouchPoint also has an app for Check-In. It is listed as TouchPoint Check-In in the app stores. After you download the App, just set your Server name. This is the unique part of your church’s TouchPoint URL, such as Bellevue. Then press Accept . If you have a user account on your church’s TouchPoint database, click the Log in link in the top right corner and enter your username and password. It is the same as when you log in on your desktop. Once you log on, you will be asked to create a 4-digit PIN . Just enter a 4-digit number, then re-enter it to confirm. After that, when you access the App, you will not have to enter your username and password, just your PIN#. TouchPoint has a separate app for using Check-In on an iPad. Look for TouchPoint Mobile Check-In in the App Store. Click the appropriate link. You will be asked to enter either your username or the email address on your record in the database. This will trigger an email with a link so you can set your password. If a person downloads the app and tries to create an account, they must be in your database already and have an email address on their record. Taking photos with your mobile device is probably the best way to add a picture to a person’s record. You can move around to get the proper lighting, and you can get up close to get a good head and shoulders shot. These are uploaded immediately to the server when you save them. Always use portrait mode when taking an individual photo using your mobile phone. In landscape, the pictures sometimes end up upside down unless you have the camera facing away from you and the home button on your right. But for an individual photo, portrait is the preferred mode. The app was originally designed to help ministers who are making visits to their members, so they could easily get driving directions to the person’s home or to make a phone call. But also, be prepared for a home visit or a visit to the hospital, where they might encounter family members or extended family members. Using the app, they are able to find out the names of the family members and drill down to any extended or related family members if they exist. If you have pictures in your database, they can even refresh their memory by viewing the person’s picture. There are a few qualifications in order for a user to take attendance using the App. In the above-mentioned article, notice the section regarding a setting to allow OrgLeadersOnly users to find guests in the database. Attendance on the iPhone / Android was designed to make it easy for group leaders to take attendance for their small groups that meet in homes or other locations than the church itself. It works best for small groups (30 or fewer), but can be used for any size. Using this App, you can not only take attendance, but also add someone as a guest, creating a new record, if necessary. For guests who want to join the group, you can do that as well. All TouchPoint users, except those with a My Data account, will have an icon for Tasks when they log in to their church’s TouchPoint app. Of course, the app on an iPhone looks just a bit different than it does on an Android; and each Android device may look a little different from other Androids. However, the functionality is the same. This is mentioned below as well. Be sure to note that you can drill down wherever you see an icon next to an item. Or, you can make a call, get directions, send an email - all right there in the Tasks component of the app. Below is a list of the Task options and the functions you can perform on the app. These sections will appear at the bottom of the screen on iPhones and at the top on Androids. Ministry-related Tasks are the only type that appear in the app. So, New Person Data Entry Tasks will not display in the My Tasks section. These are new Tasks delegated to you, which have not yet been accepted or declined. If you allow notifications, you will get a notification on your device as soon as a Task is delegated to you. From the notification, you can go directly to the Task and click Accept/Decline . If you decline, you have a field to list a Reason . If you accept the Task, the Task moves to the My Tasks list. When you accept or decline, the owner receives a notification in the app as well. This is a list of your Active Tasks. Those are Tasks you have accepted, but have not yet completed. This is also where you will see any Tasks that you own, but that have not yet been delegated. Before completing the Task, you can view the Task Details or the Person Details . You have options to go further - send an email, make a call or view more information about the person and their family. Look for the icons. These indicate you can do / view more relating to that item. After you have actually made the contact requested in the Task, then you can select the Task from the list, click Complete and answer Yes to the prompt. This will take you to the Contact form, which is actually in the mobile version of the web application. You will already be logged on, so, this is a seamless transition. Once you complete and Update the Contact, you can use the link in the top left of the screen to go Back to the app . Or, you can select + Add Followup Task and create and delete a Task before returning to the app. Your edits will not be saved on the Contact form until you select a Ministry, a Reason, and a Type. You will see prompts to that effect. These are Tasks that you own (you either created them, or someone else created them and transferred ownership to you) and that you have delegated to someone else. You can view the Task Details or the Person Details as described above under My Tasks. You may also need to call or email the delegate if they have not completed the Task in a timely manner. You can do that right from the app. This list will display the 20 most recently completed Tasks that either you have completed or Tasks that you own that the delegate has completed. Click the Status , and view the Contact that was created when the Task was completed. Use the Back to App link to return. At that point, you could also create a Followup Task about that person. All Tasks must be created in the normal application. In a later version of the app, we will give you the ability to create a Task while in the app. However, you can Create a Followup Task after completing a Task with a Contact, as you are still in the normal application at that point. Also, email notifications will still be sent as usual, in addition to any app notifications. This video demonstrates the Task feature on the app. Click the square brackets in the bottom right corner to view it full screen. You can have registrations display on the app, making it very easy for people register for your events. Please read the document referenced below for more information about this option.